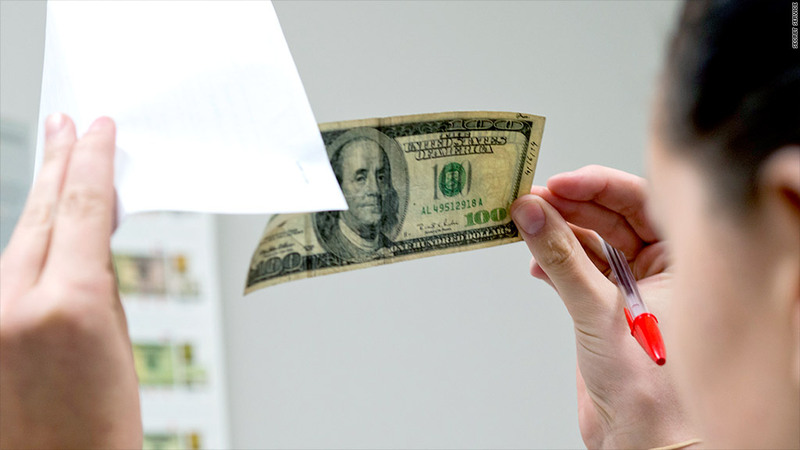 A federal investigator examines a counterfeit $100 bill. For the last 15 years, at least $77 million in sophisticated counterfeit $100 bills have flooded into the country from Israel. The Secret Service says it has now broken up the ring believed responsible for bringing the bills here, just as the counterfeiters were starting to produce the bills at a new plant in New Jersey. According to a court affidavit, the bills had many of the security features designed to thwart counterfeiting, including watermarks and a security thread. They were printed on high-quality offset presses. Criminals would pay about 40% of the face value of the bills for a "10 stack," or $10,000 worth of the bills, and then pass the notes at everything from local CVS drugstores to car washes to Lowe's home improvement stores. Most of the bills were circulated along the Interstate-95 corridor in the East. The Secret Service got on the trail of the counterfeiters in spring 2012 when four of the bills showed up at a Loan Max in Woodbridge, Va. Most of the bills are believed to have been printed in Israel. But this January, officials say, counterfeiters set up a printing operation in a Cherry Hill, N.J., warehouse they had purchased. Authorities eventually found a Heidelberg offset printing press along with four smaller printing presses and computer equipment. By May, the Secret Service was ready to start making arrests. It executed search warrants in five states and arrested four Israelis, seven residents of New York State and two other defendants from Georgia. The indictments against the ring were revealed by the agency last week. While the Secret Service is best known protecting the President and other federal officials, the agency was started in 1865 for the purpose of combating counterfeiting.